Stock #4003, Retail Price $24.95. To buy a copy now, click here. For more information about the game system, go here. New Game Value: Drive a starship for less than half of the cost of Klingon Border. This special package includes four starships, a complete rulebook, playing pieces, and an unmounted mapsheet. Everything in Federation Commander is designed for FAST play and to allow players to learn the game in under an hour. The dynamic "Pay as you Go" energy system does not bog down game play. Damage allocation is done by a fast "one die" system. For more information about the game system, go here. This product does not require any other products for use. All other Federation Commander products will work with this product. Components: 74-page Rev-6 Klingon Border rulebook, 72 half-inch full color die cut playing pieces, full-color double-sided laminated player reference card, four full color double-sided laminated ship cards, and an unmounted map sheet. Since Academy has the complete rulebook (identical to the rulebooks in Klingon Border or Romulan Border) you have everything you need to play Federation Commander with those who have acquired larger game sets. Where do I go from here? 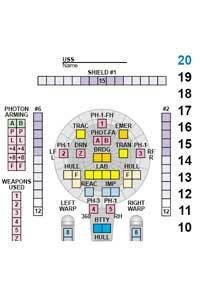 You can find dozens of additional ships in the free issues of Communique, so you're not limited to just four ships. You can use any of Boosters #0 through #12 with FC: Academy. 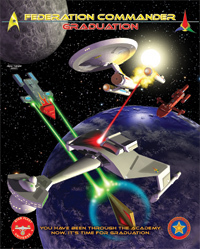 Once you love the game, you can upgrade your Academy game set to the full Klingon Border game set with FC: Graduation. 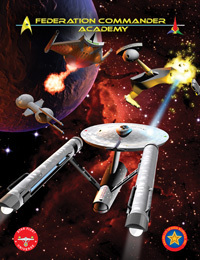 You can use Klingon Attack, Romulan Space, Romulan Attack, or Tholian Attack with Academy (with or without Graduation). Federation Commander: Graduation provides all of the items needed to convert your copy of Federation Commander: Academy into the full-size Federation Commander: Klingon Border. Stock #s 4004; Retail $39.95. Click here for a free PDF download of FIRST MISSIONS, the introductory rules set. Stock #4004, Retail Price $39.95. To buy a copy now, click here. For more information about the game system, go here. This product contains every part of FC: Klingon Border which is not found in FC: Academy. The point is for people who bought FC: Academy to be able to easily upgrade to the complete game experience. Included are the one-inch counters, six-hard mounted map boards, and 14 ship cards.